Bad Sprains, How Long Until The Joint Returns To Normal? Discussion in 'Downhill & Freeride' started by HardtailHack, Aug 22, 2012. Probably shouldn't be in this section but I don't want the other types answering hahaha. Three months ago I had consumed a few bevvies and jumped off a small step on to some wet grass and my foot slid and rolled outwards. I must admit I was surprised how much it hurt and soon after it started swelling like crazy and ended up going for X-Rays later on. I went to a physio after five days as it was really swollen and he had me doing some crazy stretching which I was a bit concerned about but he insisted I get back on my foot as quickly as possible so it needed to be stretched. I went to him a couple more times for massages to help disperse(?) fluid as I had pitting edema and he also did some dry needling which I swear does nothing useful. After that I gave up on the physio and ordered an MRI a month after I rolled it and they found that it wasn't in great shape and told me to stop doing the exercises the phsio set. So three months on it still feels less than great and still swells after a ride or for some weird reason from walking on floorboards. 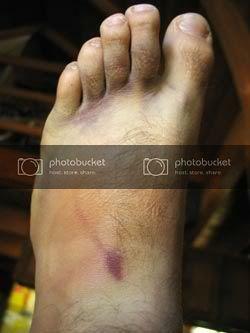 Has anyone else had dramas like this after a sprain? So the MRI just showed soft tissue damage? No boney pathology right? Sprains are the worse. They can take 8-12 weeks to fully heal because ligaments and tendons are not as well vascularized compared to bone. Im wondering if you have stuff going on within the ankle joint/capsule if its still sweling up 3 months since the injury. Maybe we are talking about the same thing but id get a second opinion from an orthopedic surgeon that specializes in ankle/foot. I wouldnt say physio, but light movement, whatever doesnt hurt. Feet and hands are some of the toughest to heal, 8-12 weeks of proper treatment and you should be rolling. Cheers guys, I did do the RICE thing to begin with but it did zip, the swelling got continually worse until about the five day mark. I forgot to add, the GP I ended up going to was formerly a Physio and put me on soft beach sand walks and got me using a balance board which has helped. After seeing him I spent two weeks resting it and gradually got in to the exercises but I seem to have reached a point where it has stopped getting better. I'll put the MRI report up if anyone knows what it means. You need to keep it wrapped with actual tape. for a long time brother. Anything that recurrent needs bracing to keep you from repeating minor tears over and over. Every little bit of tissue in there is probably not able to support the others, so even running around trying to favor it is making repetitive tissue tears. Buy yourself a pair of compression socks. They won't make you recover from exercise all that incredibly, but they do wonders for swelling. Until you get off it, stop repeating the damage and allow the swelling to go down so everything can tighten up again, you're just spinning tires in the sand going nowhere. Im neither a doctor or a physical therapist, but definitely an experienced klutz with plenty of doctor and ortho visits including multiple ankle injuries (inverted, everted w/ avulsion...) and the idea of ANY type of range or load therapy before ~4 weeks on this type of injury is a very very very bad idea. Weight bearing is a very bad idea. Massaging and needling torn/damaged ligaments? Counterproductive at least. You might want to find a good orthopedic practice; this GP seems out of his gourd. As long as it's swelling, anti inflammatories and ice are in order, as long as necessary. Walking, balance boards or any stressful motion is going to keep tearing things like Bizutch pointed out. Oh! sorry to hear this.. 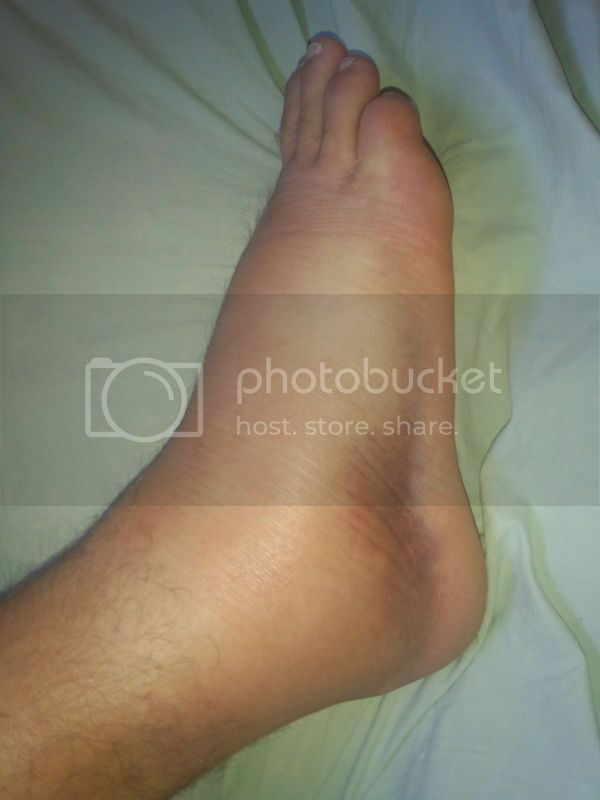 I rolled my ankle 2 years ago as well. It popped pretty loudly when it happened and I was pretty sure it was broken immediately after! I did the usual RICE like everyone is suggesting. I also went to a traditional chinese doctor for a massage and a herbal medicine wrapping. I was kind of skeptical about it, but my parents insisted that it worked. Well, 2 weeks later I was back on the bike. I wasn't even 100% healed, but I taped my ankle nicely to go riding. Kind of what I was thinking. I lost count of how many broken bones I've had in my ankles and feet but even if it's just a bone chip, that's what bone injury looks like........not just a sprain usually. You can't tell in the pic but it has the same ribs as this. PLUS it has the cross straps. You can tape up your ankle every time you want to ride but that gets old and this brace is by far the closest substitute. It's badass. I found those things after spending hundreds of dollars on a bunch of other shlt. Those royce ones rule. I'm glad I saw this thread. I was trying to remember which ones those were. I just sprained another ankle myself and gave all mine away a year or two ago. And yes, I'm ordering one right now as well. 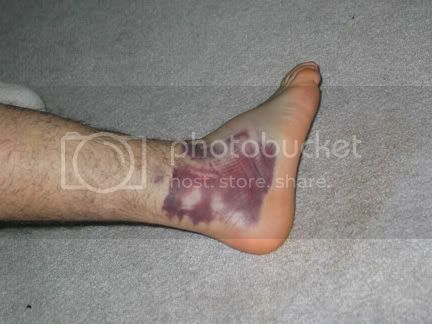 kidwoo how is your ankle now? Just today I went out and grabbed an ASO Ankle Stabilizer and it seems OK but the sides don't breathe at all. I got out and did some light trail building today and it was nice to not have to watch where I put my foot down on every step. After an hour and a half I was starting to get a bit sore so I stopped and I also realised I need to start doing excercises for my shoulder again. My brace showed up and I went dirtjumping yesterday. I thumped a landing and didn't cry so it must be getting better. It's nowhere near as gnarly as what you did though. I haven't had one of those in a while. Can you stand on pedals? I've done a few xc rides to keep myself sane. It always seemed like walking around on uneven ground hurt my ankles worse than some mellow riding. There are a lot more angles to twist your foot around than just pedaling does. Just make sure to lock it out if you do (IE tape or brace). Maybe these will make you feel better. Looks like freakin blood poisoning. And this is a completely different one. I've never had bad brusing like this or like what you've got HTH, and NOT had a bone involved somehow. Either way, it's not like you'd really do anything differently. Just pay attention to the pain and keep that thing immobilized of you're going to go out and play. It would have to be really bad to indicate some sort of more in depth treatment. And if it WERE really bad, the MRI would have shown it......even to an idiot. Hi, first you have to be sure there's no unstability, because that's first cause of ankle sprain not going well, then be sure no other injuries are present, OC lesions (cartilage lesion), bone injuries (even if you don't have a fracture you can have some kind of bone swelling), also peroneal tendon injuries can hapen along with ankle sprains, if your MRI was not made with contrast you should consider try one, but first go visit a foot and ankle surgeon, no GP, no physio. I did the exact same thing as you about 8 weeks ago, The best thing I've found is exactly what bizutch said. I tape mine up most days, and if I don't tape it I use one of those pharmacy braces. I also use an arnica style product if I walk on it funny and the swelling starts to come back. Once the swellings stopped then a heat pack at night seems good too. It's a **** injury, just have to wait it out. Had a extremely bad wrist sprain several years back. To the point where it went black and blue within seconds of smashing it. Doctors thought it was broken untill tests were done. I also broke my wrist and hand before. Broken wrist took about 6 weeks in a cast, then I'd say 2 months after to regain mobility and strength back to the point I could do a push up. This was mainly due to muscle atrophy and not the break itself. Sprained wrist took 4 weeks before I could ride a road bike, and about one year to start feeling somewhat normal again. TL;DR? Bad sprains take a lot longer to heal. Take good care of it while it's healing. I have still been lazy with this and my ankle is still swelling up after a ride or walking bare foot on hard floors. I seem to have full stability there and riding with or without a brace makes no difference on swelling or pain but it still seems the more I try to stretch the more painful it is afterwards. I managed to tweak it a bit a couple of days ago and for the first time in ten months I could walk down stairs like a normal person, but now I'm back to my normal. I'll get to the doctor soon and report back.